The best way to get to know a community is by scheduling a tour. 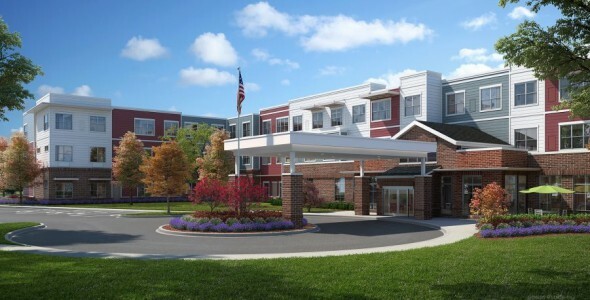 See the facilities, meet the staff and residents, and get a feel first hand what it's like to live at The Sheridan at Bethel Park Assisted Living. Senior Lifestyle celebrates 30 years of inspired service and hospitality through the unveiling of a new family of communities – The Sheridan Collection. Our new, modern approach to senior living and care, The Sheridan at Bethel Park, comes to Bethel Park, Pennsylvania in Fall 2018. Providing Personal Care and Memory Care in Pennsylvania with best-in-class care customized to the wants and needs of each resident, The Sheridan at Bethel Park is located just seven miles southwest of Pittsburgh on Cool Springs Drive, right next to Cool Springs Sports Complex, a facility that includes an outdoor driving range and mini golf. There’s plenty to do and explore at The Sheridan at Bethel Park. Our residents will enjoy chef-prepared meals with friends in the elegant dining room, as well as nourishment for the mind in our library. In our common areas you can play games in the living rooms, get creative in the art studio, visit the onsite salon and spa or make use of the fitness equipment provided. Outside our personal care in Bethel Park, residents enjoy beautifully landscaped outdoor spaces with exterior courtyards and walking paths. Memory care residents will enjoy a Tranquility Garden as well as a secure outdoor terrace.